Oral therapy with ALLN-346 was well-tolerated and resulted in significant reduction of plasma urate and normalization of urine uric acid excretion after one week of treatment in an animal model of severe hyperuricemia. The effect on plasma urate reduction was similar to the ALLO dose of 50 mg/L, and the effect on urine uric acid excretion was superior to the maintenance dose of ALLO 150 mg/L which is required to sustain this animal model. 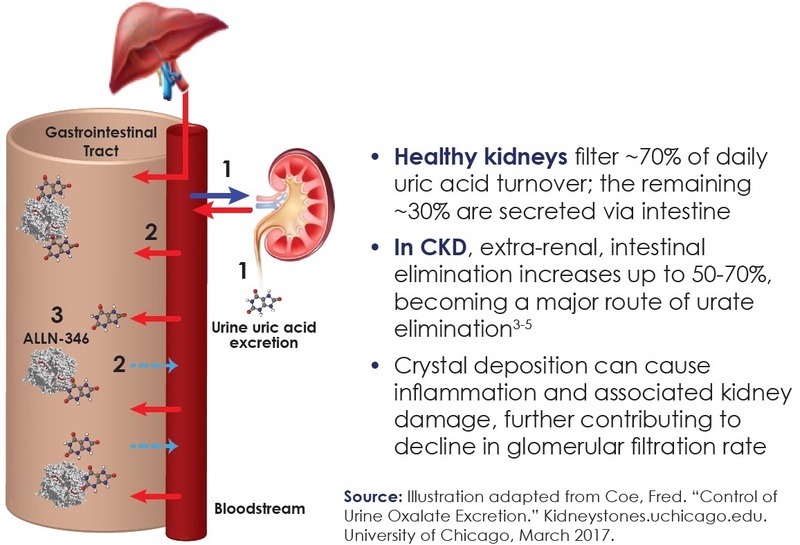 The underlying physiology of hyperuricemia and the extrarenal pathway of uric acid elimination corresponds to the ALLN-346 mechanism of action of degradation urate along the GI tract. Future experimental studies will address the effect of ALLN-346 on fractional excretion of uric acid (FEUA) and potential renoprotection.